Proof of the red sweater set. (just the tank is pictured, thank goodness) This was taken the day we moved in. Take a deep breath. You are excited and overwhelmed and probably the only freshman who brought an entire jar of quarters with you because you are worried doing laundry. What freshman comes to college worried about laundry? You also packed a cutting board, a knife and an orange peeler in your plastic containers because apparently you are worried about not being able to have apple slices for snacks and heaven forbid, you have to peel an orange with your fingers. You want to be prepared. I get that. But I think sometimes you use wanting to be prepared as a mask for wanting to feel in control. Preparing is good thing; you will always be a prepare-er and a planner. But you will eventually learn that even the most prepared people can’t actually control life. You will probably feel insecure your first few months here. I am fairly certain wearing your red Ann Taylor sweater set and pedal pushers is not helping. You may call your mom on day three of orientation in tears because you feel like you don’t fit in. You will babble about how everyone wears brown flip-flops and Gap jeans and throws their hair-up in messy buns. You will sob through your tears, “I don’t even know how to do a messy-bun.” Your mom will listen and empathize and so dearly want to make it better. She will offer to come up one weekend and take you shopping. You have never owned anything from The Gap before, but you buy two pairs of jeans and some new flip-flops that everyone calls “Rainbows.” And you feel a little better, but you will soon learn that changing your outfit doesn’t automatically change your feelings. Over the next four years you will learn to pay attention to how you’re feeling. You will learn to be honest with yourself first, and then with others. You will learn this is how meaningful friendships are formed, not from competition or comparing, but from the quiet “me too” moments shared sitting in the stairwell. You will be surprised the first time another girl from your dorm with the perfect messy-bun confides in you how overwhelming the DC (dinning commons) is and how her jeans also feel too tight from indulging in too much frozen yogurt. You will say, “me, too” and realize how comforting it is to know that you’re not the only freshman girl who worries about what food they will have in the dinning commons and who you will sit with and if you eat another brownie your cool Gap jeans may no longer fit. You never thought about these things much in high school, but everything now feels new and magnified, including how you’re your clothes do, or do not fit. You will probably wonder if you are the only person who doesn’t play a musical instruments or wasn’t a homecoming princess or the student body president in high school. You will be envious and insecure and you may end up convincing your parents to buy you a guitar for Christmas because you signed-up for a beginning guitar class second semester. Because everyone at Westmont plays guitar, right? After 12 classes of “Twinkle, Twinkle Little Star” you might decide that in fact you do not. And that’s ok.
College is as much about figuring our what you like, as what you don’t like. And you don’t have to figure that all out right now, ok? Give yourself time and some grace. Other people will sound like they have their whole 4-years and their entire life planned out. And maybe they do. You probably think you do, too. But here’s the thing, there is so much to explore and learn. Fight off the pressure to have it all figured out right now. Develop a pat answer so when the 89th person asks “So, what’s your major?” you can respond confidently with “Well, I’m thinking about English, but I really like Sociology so I might take some classes in both.” Sure, it sounds nice when you can map out your next eight semesters clearly on paper, but life is not meant to be lived on paper. Life is dynamic, and changing and if you spend too much energy trying to plan it all out, you might miss the subtle way God is leading you to something new. Some students probably need to be told to not sign up for too much or overextend themselves, but you Michelle, you need to be gently nudged to go ahead and take some risks. Don’t sign-up for the Speech and Debate Tournament and then cross your name off because you let your own fear and the other names on the list intimate you. Try it. Take the class that sounds super interesting even if it’s early in the morning or doesn’t give you any credits toward your major. Sometimes passion trumps practically. You will find as you grow-up the converse is often true. So take a risk and take the Cross-Cultural Communication class or the Human Nutrition class, those passions very well may shape who you are and where you end up one day. You don’t have to try everything, but at least try something. Find one thing to pour yourself into. It’s easy to focus on yourself and your grades and your plans for the next four years, but college and life are so much richer when you can focus on someone else as well. Can we talk about dating real quickly? Just let whatever ideas you have of dating go for the time being. You will probably have more DC crushes* that you can count and you will most likely talk to exactly none of them. You will do awkward things like send a thank you note to the attractive upperclassmen who kindly helps you open your mail box. One day when you tell your future husband this story he will laugh and affirm that indeed that was weird. Some of your friends may meet and start dating their future spouse and they will be the cutest couple on campus. But the majority of people don’t actually meet their spouse while at college. I think if you let that expectation go now, you will enjoy these next four years a bit more. Sometimes expectations can lock you into an idea, and take away the opportunity right in front of you to grow and learn. In fact, you may find that you have to let go of many expectations before you actually meet the wonderful man you will one day marry. Speaking of marriage, when Mark the RD shares at your first dorm event that having a roommate is the best preparation for marriage don’t scoff at how ridiculous that sounds as you Ashley look at each other and giggle, because there is SO much truth there. Sharing a room with another human being forces you to pay attention to how you live. And you might actually realize that not everyone lives like you. You will learn that apparently not everyone gargles with salt water or puts lotion on their feet and then sleeps with plastic bags covering them. When you share a light bulb and a door and bathroom with 8 other girls you learn a lot very quickly. And I bet one day your future husband will thank your previous roommates for teaching you to not slam your drawers shut in the morning or slurp your water too loudly. Your roommates have the potential to be your best friends or your most frustrating enemies. Make them the former. Learn how to bring up things that annoy you and how to respond with grace and love when they do the same. Those lessons will carry you through a lifetime. The classes you take will ultimately give you credits to graduate, but I would argue it’s the professors you have that will give you wisdom for life. Hang on to their words and ideas because they may shape the way you approach questions of faith, science and literature for years to come. In ten years when you write something or read a well-thought out article you will always hear your favorite English professor’s voice ask, in the kindest, most profound way, “So, what?” So what does this mean for me? For my community? For our world? She will ask you this about your own writing and about the books you are reading in class, and you will find yourself asking this same question about your life. You may forget the details of what you learned 10 years later, but you will not forget the people who taught you. Get to know them. Ask them questions. Observe their life. And if they give you an invitation into theirs, take it. Westmont’s professors are truly some of the richest part of what makes Westmont College unique. Can I make one more request? Please, fight the complacency to complain. It’s normal and can often be an easy way to connect. No one will disagree for a second that college classes are hard. There are lots of essays to write and tons of reading to do and it can all feel a bit overwhelming when you’re in it. But try really hard to choose to see it has a privilege; a privilege that only 3% of the people in the world get access to. You may not belive me now, but in ten years you may actually miss those spiral notebooks and textbooks and being in an environment where you are scribbling notes and soaking up knowledge every day. When you have to do something it feels like a burden, and it’s easy to complain about it. But don’t see Westmont as something you have to do. See it has a choice; something you get to do. You will probably still complain mostly about going to chapel because somehow you feel like it’s not a choice. But it is a choice. You have a choice in how you choose to view it. And 10 years later you might still be able to hear Ben Patterson’s voice reciting, “Murchison Gym, Santa Barbara, California, United States, North America, western hemisphere, planet earth…Universe, mind of God.” Even if those words may not mean much when you are sitting on those hard wooden bleachers, just hold on to them and tuck them away because one day when you feel far away and live in a different culture and country those words will surprisingly comeback to you and remind you of where you came from and who you are. Michelle, you came to college with your life packed in the back of your parents mini-van and a heart full of lists and expectations. But I am going to let you in on a little secret. Life cannot always be labeled and organized and fit nice and neatly into plastic containers. You will learn that over and over during these next four years. You will learn how to make room for un-answered questions and trust a God who is more in control than you are. You will learn how to live closely with people who will become lifeline friends and in that process you will learn how to love better and how to listen well. You will learn how to think deeply and critically on a range of issues and also how to disagree civilly with people whose view is very different from your own. I will argue that these four years more than any other, will shape the way you think and how you choose to do life. Westmont will give you the skills for whatever kind of career or calling you choose to pursue, but even more so, it will shape your character for the kind of person you will become. Enjoy these next four years, relax a little and give up on the messy bun. It just doesn’t work well with curly hair. 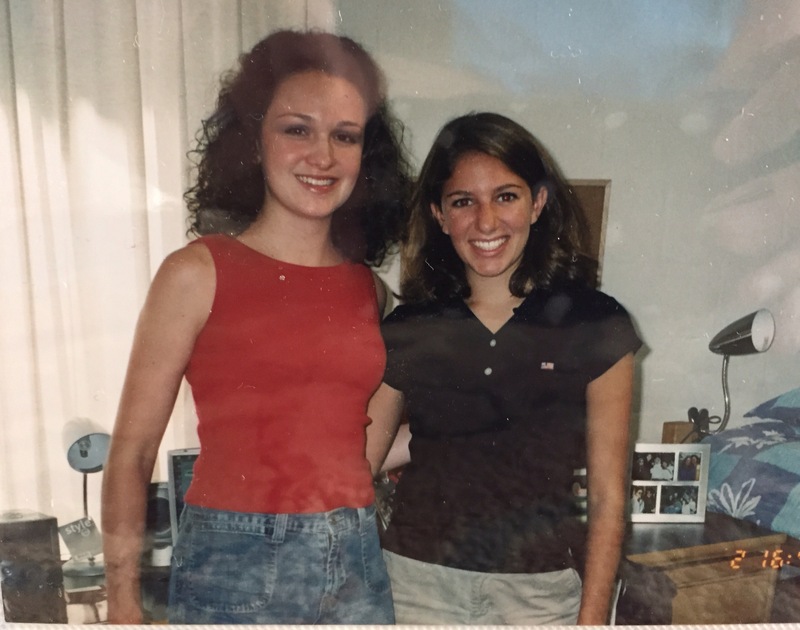 Fourteen years later, living a life so much different (and better) than I ever expected, and so grateful for the role Westmont has played in that. Hindsight is definitely 20/20! I wouldn’t change my years at Westmont for anything. I learned so much about myself and who I was to become during those four years.I think Mark the RD said the same thing to me and my roommate. I totally laughed at the DC crushes, we all had a ton. Hope you enjoy the reunion. I might save this for my girls, it is good advice!